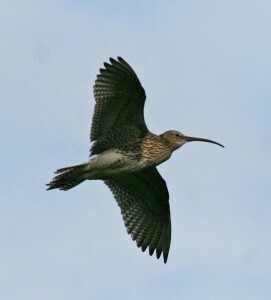 An important part of the SWT / SOS “Save our Curlews” campaign is knowing how many breeding pairs there are, where they are, and the population trends across the County. (the Kemp Valley area is not shown, as there are no Curlews there, but it is south of the Upper Onny, and east of the Upper Clun, CWG areas). In 2018, around 80-100 pairs were found altogether, the vast majority of the County population. Over 270 people participated, and put in nearly 2,300 hours, a clear indication of the commitment of local people to saving our Curlews. In 2019, these 11 Community Wildlife Groups will be repeating their Curlew surveys (also looking for Lapwing, and, as an optional extra, a number of other threatened species). This usually involves three half-day visits, around 1 April, 1 May and mid-June. All the groups need more helpers, so anyone who can recognise Lapwing and Curlew should get involved, please. The surveys are easy, simple instructions are provided, and fieldwork training is available for anyone that wants it. The results are used to promote local conservation. In particular, they pinpoint Curlew territories to help the “Save our Curlews” campaign to locate and protect nests. A meeting to present the results of the 2018 survey, and make plans for 2019, including deciding who surveys which square, is being held in most areas, as shown in the table. Contact details are given for the two groups that do not have planned meetings. All meetings start at 7.30pm, and everyone will be welcome. The results of the survey by each CWG in 2018, and contact details, can be found on the relevant CWG part of this website. 3 new CWGs in the north-west to join the Shropshire Community Wildlife website. As a first step these groups have put together the following very useful document which looks at existing wildlife activities covering the area. Wall brown (Lasiommata megera) – one of the butterfly species being sought in Group surveys. If you want to contribute effectively to local knowledge and conservation and you live or work in one of our Group’s areas, we welcome your involvement. Groups are for everyone in the community, not just experts. Your enthusiasm and interest in the area are far more important than specialised knowledge. Most of the target animals and plants are both important and easy to recognise and search for. You will receive initial training on identification and simple survey methods, and regular support and advice. Expect to learn a lot and have fun doing it. This is “citizen science” at its best! There are currently eight Groups and more may be created where there is sufficient interest. Southern Shropshire’s eight Community Wildlife Groups (CWGs). The grid on this map shows 10 km squares of the Ordnance Survey national grid reference system. Group names are abbreviated but are identified (and linked) in the list in the following text. Note the area of coverage of the SACWG overlaps that of the UOWG, the KVCWG and the RVCWG: the boundaries of the RVCWG and the SACWG are shown with appropriately coloured lines in the overlap areas. CWG projects are defined by the behaviour of and habitats used by the wildlife studied so that Group boundaries should be regarded as nominal. For a full-screen version of this map, click of the image. To return to this page, use your browser’s “back” button. Most of the area covered by the Groups is in the Shropshire Hills Area of Outstanding Natural Beauty. For more information on areas of operation, programme of activities and contact details for any group, select its name below. The Upper Onny Wildlife Group (UOWG) covers 126 square kilometres between Long Mynd and the Welsh border, mainly between the Long Mynd and the Welsh Border (from just north of Bridges, Pennerly and Shelve, as far south as Horderley and Bishops Castle), in the parishes of Ratlinghope, Wentnor, Norbury, Myndtown, More and Lydham. The Upper Clun Community Wildlife Group (UCCWG) covers the catchment area of the River Clun west of Clun, including the valleys of the River Unk and the Folly Brook, plus that part of the Bettws y Crwyn parish that is outside the River Clun catchment area. The Kemp Valley Community Wildlife Group (KVCWG) covers 84 square kilometres around Brockton, Lydbury North and Kempton, including Colebatch, Clunton to Aston on Clun, and Hopesay to Edgton. The Clee Hill Community Wildlife Group (CHCWG) covers 80 square kilometres, centred on the open hill land of Titterstone Clee and Clee Hill common. It extends approximately as far as Knowlegate and Knowbury to the south, Bitterley to the west, Cleedownton and Bromdon to the north, and Catherton Common and Doddington to the east. The Strettons Area Community Wildlife Group (SACWG) covers 108 square kilometres, centred on Church Stretton, and includes the Long Mynd and Stretton Hills. It extends approximately as far as Longnor to the north, Church Preen to the east, Marshbrook to the south and to the western edge of the Long Mynd. The Wenlock Edge Community Wildlife Group (WECWG) is a relatively recent addition to the CWG family. Follow this link to learn how to become involved in the activities of this new Group. The Camlad Valley Community Wildlife Group (CVCWG). This new group’s area corresponds roughly with the Camlad catchment and includes Churchstoke, Hyssington, Priest Weston and Chirbury. The Rea Valley Community Wildlife Group (RVCWG) is another newly-formed group. As its name suggests, it covers the catchment of the Rea Brook and encompasses Pontesbury, Minsterley, the Stiperstones and the Hope Valley. Most of these groups are monitoring their local Lapwing and Curlew population, along with other target bird species, local plant life and butterflies. Other activities include surveying hedgerows and verges, identifying potential County Wildlife Sites, and running Bird, Plant and Butterfly Walks to attract new members. All want new members to help with survey work. Remember that training is provided for people who want it. Each of the Groups will make collective annual decisions about the continuation of current projects and new surveys of other species and types of wildlife, based on local interest and demand.